There is more to swimming for many people than the endless laps in the swimming pool. Why not try open water swimming where you can get up close and personal with real natural aquatic environments, and enjoy everything they offer? Lakes, estuaries, oceans, reservoirs and rivers all offer great swimming venues with wonderful scenery, wildlife and adventure. No more walls and turns - you can swim for miles and miles; kilometre after kilometre; in open water where you can find a real rhythm in your stroke. There are lots of events, clubs and groups that you can join and enjoy all the pleasures that open water swimming has to offer, including maintaining your fitness and health. 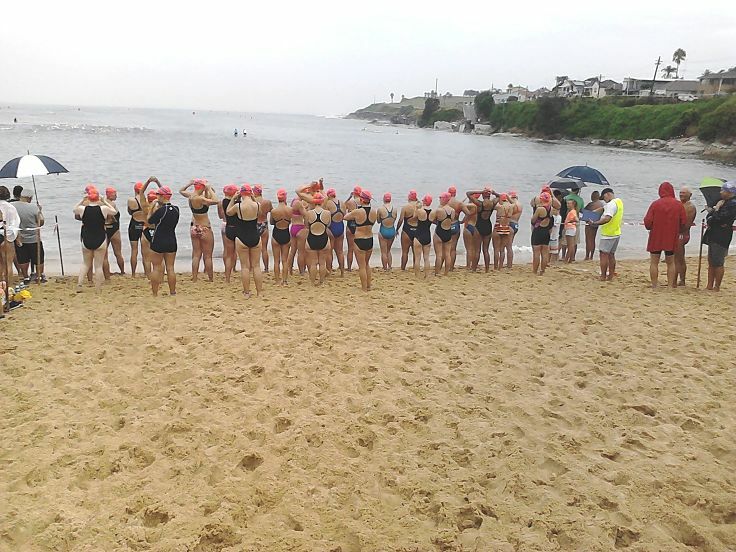 If you are a triathlete or want to join on various fun events that involve swims, runs and cycling then you will need to prepare yourself for open water swimming, and most events are held outdoors. There are a plethora of competitive and fun open water swimming events held all around the world that cover various distances, from 100-300 yards or metres across the local pond or river to 6 miles (10 km) or more. Some of the major open water events and swimming races are Manhattan Island (28 miles; 45 km), Tampa Bay (24 miles; 39 km), the English Channel (30 to 40 miles; 48 to 64 km ) and the Rottnest Channel Swim (12 miles; 20 km from the coast of Western Australia to Rottnest Island. The Open Water World Championships, supported by FINA, for distances of 5km (3 miles) and 25km (15 miles); and various other distances as well. Open water swimming is also an Olympic event. In Australia there is a calendar events on almost every weekend right around the country (see Oceanswims Australia). For Europe see ( Open Water Swimming Europe ) and for USA see ( US Upen Water Swimming ). Various clubs and informal groups run regular training swims and offshore swims for simple enjoyment. For triathlons, open water swims are usually the first leg of the race. Distances can vary from the sprint triathlon's short (500 metre; 0.3 miles) swim to the challenging Ironman distance (2.4 mile; 4 km). Build-up your pool training to the Open Water Race Distance - This may seem obvious but you should swim the race distance in the pool at least once before the event, Develop a schedule and plan to increase your laps to meet the challenge. For speed you should train to match your target time for the race. Close your eyes - Practice by swimming 7 to 12 swimming strokes in the pool with your eyes shut, and then lift your head and sight above the water. This regular sighting is needed during an ocean swim to keep on track. This will also help you to swim straight and on-track in open water without being guided by the black lines on the bottom of the pool. Many people like to wear goggles when swimming in the ocean to see the fish and other things. However, many people don't like to do this, as the dark shadows freaks them out, and so they choose goggles with darkened lens or close their eyes when swimming in goggles. 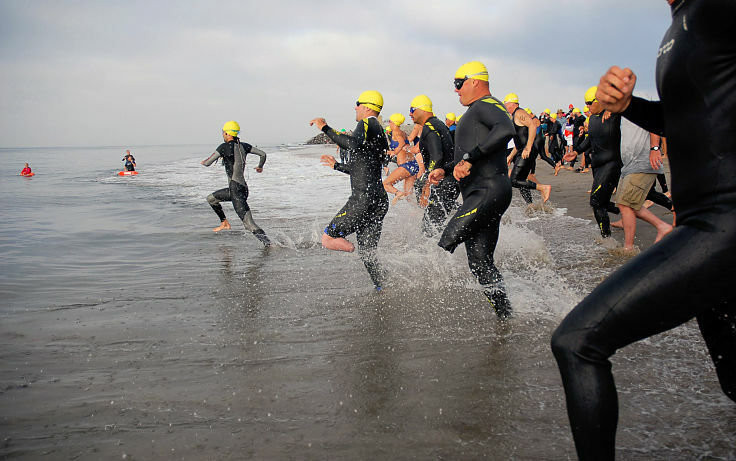 Get off to a very fast start - Practice for the start of an open water race because otherwise you will be left flailing in the wash Most of these races start very rapidly before calming down to a steadier pace. If you are going to take part in an ocean swim, particularly for a triathlon, a very fast start is essential. Try performing or simulating the rapid starts in pool or open water training so that you are well prepared. Practice Dolphin' It - Practice dolphin jumps and dives - pushing up off the bottom in shallow water and shallow diving through the waves. You can also practice this in the shallow end of a pool to develop the technique. However, don't dive off the side of the pool, but rather perform short dolphin plunges from a standing start in the shallow water. Heads Up to Keep on Track -Practice regular head up sight-breathing in the pool, raising your head up to gaze ahead in tempo with your breathing. Start by looking up every eight strokes, eyeing a target in the pool such as a window, seat or pillar and gradually increase the number of strokes between head-up sight-checks. You need to train the muscles in your neck to do this and learn how to do so without affecting your stroke or speed. Become more Effective Swimming for a Long Distances - Set yourself a goal to reduce the number of strokes per laps by improving your efficiency. Get some coaching or do some courses to make these improvements if you want to be competitive.. Put on the wet-suit or swimming vest - Always give a brand-new wetsuit and thorough try-out in the pool before using it in open water, especially in a race. It will surprise you how long it takes to get accustomed to using it , including toughening the skin around the areas prone to chaffing or blisters. Even with an older wetsuit, you need to wear it for several few pool practices before a race. Do the race distance broken into staged swims with a short rest in between. Pacing - Open water races usually start out fast, as everyone jostles for position and tries to clear the pack , then slow-down into a moderate pace. You may also need to do surges during the race to get past various competitors. To train for surges and a fast start, try this set: 5 x 400 m with one to two minutes rest. The 400 m swims should consist of: 100 m very fast swims followed by a 300 m slow to moderate pace. Make sure you always swim with someone else or in a group especially in the ocean. Always tell a lifeguards or someone else what you are doing and when you expect to be back. Develop an emergency plan and stick with it - such as sending one swimming to shore to get help while the others stay with the injured swimmer and slowly head towards shore. Develop your plan for coping with jellyfish, cramps, exhaustion etc. 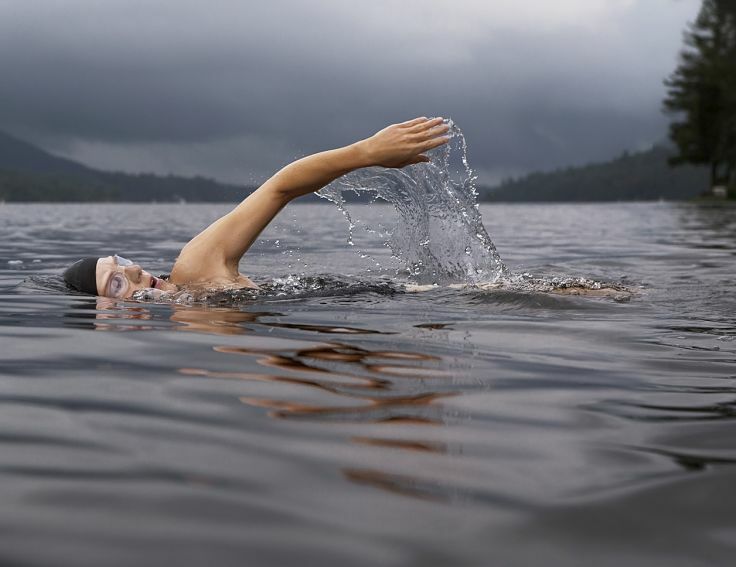 You can train using a wide variety of open water swimming workout -short sprints followed treading water or floating, long straight swims, and interval training where you vary the intensity level. Pace yourself using stroke counts, which is much easier than using time or distance. Using time spent swimming for workout duration rather than distance swum, unless you have a set route. Stay close to shore - don't go too far out! Learn to use the waves and swell by ride up and slide down - dive under the broken waves. If they are permitted, wetsuits properly designed for open water swimming will provide a great boost both in terms of keeping warm, extra floatation and additional speed and higher efficiency. Overcoming a fear of open water swimming - the benefits are huge and work at it if you have trepidations. Get out and Do It - Experience is the key to success and enjoyment of ocean swimming. Drafting - that is swimming, using the waves created by of another swimmer, or group of swimmers, can literally pull you along. Generally, men and larger people create larger waves than women. Make use of this by swimming directly behind someone who is a little quicker than you, and get the benefit of their work. 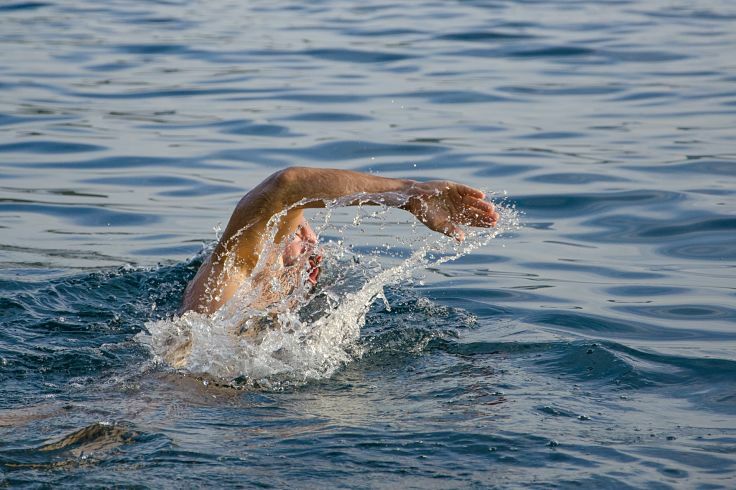 A swimmer in open water is essentially like a boat. The bow wave generated by a swimmer has energy moving both forwards and laterally. These waves move at about 45 degrees out in the direction the swimmer is moving . Essentially you try to ride along these waves. Try to cruise at the same speed as a swimmer in front just to the side of their wake. Keep out of the eddies caused by their kick by moving further to the side. The ideal position is between the hips and the ankles of the swimmer in front. Combine your speed with the speed of the lead swimmer. Lock onto them and watch their position underwater. If they slow down, you slow down. If they speed up, you speed up. This means that you won't have to lift your head to check on your position - head down is the most efficient way to swim. The best draft comes from a faster, larger lead swimming when you are close to them, about level with their knees. There are no lines on the bottom to follow - Look forward and sideways as you swim for landmarks to help you keep track of where you are going and your progress. Find the right balance between looking up too often and not looking enough. Generally you can follow your fellow competitors. Develop a race plan and stick to it - This includes your preferred track such as following the shore or heading out offshore. You may also want to swim with your friends or your age group or club. Put on your water-resistant sunscreen - and don't forget your lips. Eat and Hydrate Well - It is easy to get dehydrated out in the open water and get cramps. Drink lots of fluid about two days before the race and drink plenty of fluids just before the start. Don't Get Pushed Around at the Start - The position where you start affects with how crowded you'll be in the water in the initial rush and surge just after the start. Everyone wants to start in the middle, but you're not fast enough to get out ahead of most the swimmers, you may end up have a very rough time and may be swum-over several times. For moderate paced swimmers line up at the back of the main bunch, toward the end furthest from the first buoy. Many large events have staged starts for various age and ability groups of swimmers. Even after starting a short way back, you will still be able to catch a draft (see below) from the pack, but you won't be crushed and spat out the back. Protect Your Face in the Huddle - One of the biggest risks for triathletes and ocean swim race competitors is getting kicked in the face or losing a tooth. To reduce this risk of this happening when threatened try swimming what's called 'catch-up style'. This involves leaving one hand extended in front of you while completing a stroke with the other hand. You swap arms, but having an arm in front means that you will block another swimmer's wayward foot. Avoid Close Contact with a Group - If you are in a race, avoid the flashing arms and legs of those in a packed group around you - getting bashed, bruised or scratched can hurt and slow you down and you may get your goggles knocked off. Take Stock Before You Surge - Surging to pass another swimmer consumes a lot of energy, so think carefully about what you are doing it for. In the middle of a crowded pack, passing one person isn't going to provide much benefit and may take you out of the draft. Surge at the Beginning to Establish your Position - The crucial time to work hard is right at the start of the swim. You will have to work hard, but this will get you out of the thrashing, struggling pack and into a good position to catch a draft in clear water. Of course, to establish yourself in the ideal position may take several surges and you should train for this. Stay Warm During the Race - If you are too cold your body may just shuts down and you lose motivation. so do everything you can to avoid it - Wetsuits, double caps and earplugs all help. Goggles Are Critical - Find a pair that are comfortable and fit well, both underwater and for looking where you are to navigate. But never race in brand new goggles - always try them out well before the race. Learn the Course - You cannot rely on other people as you may lose contact with them. So learn the course well and plan how you are going to swim it. Draft Whenever You Can - Drafting is a part of open water swimming and so use should use it as much as possible. You may be able to use it to hang on to a faster group of swimmers and effectively be towed along with them. Losing Your Goggles - this can be a disaster if you are competitive in a long race. Always make sure to thoroughly check your goggles the night before your race and the week before. Flex the straps and look for small tears and tiny cracks that indicate wear, especially near the clips that secure the straps. Buying a new pair exactly like the ones you are used to is a good idea, but break them in for a couple of training session. Don't be tempted to lash out and but a completely new style as they may be uncomfortable and could leak. It is a good idea to put your cap over the top of the straps as this helps stop them being knocked off. The bottom lines is that you can swim without goggles and you should trying training without them occasionally to make sure you can cope. Getting a Cramp - Leg cramps while swimming are very annoying, but surprisingly common among triathletes, especially in the calves. One obvious way to prevent them is to train properly and thoroughly with lots of stretching. Cramps can also be induced by swimming in a style you are not used to. Potassium rich sports drinks are known to prevent cramps and bananas are also a good source. So make sure you load up with potassium before the race. If you experience a cramp during a race, don't panic as most of them can be removed. Stop swimming, tread water and slowly try rotating your foot at the ankle and stretching the muscle out to ease a cramp in the calf. Try to swim slowly again without straining the muscle. If it gets worse you may have to call for assistance. Your Swim Cap Rips or Falls Off - Once again prevention is the key - so check you cap and make sure it is sound. Also tie long hair back, so if the cap falls off your hair you can still control it. Wearing a new cap on race day is not a good idea as it may be uncomfortable. Wear it in first during training. Chafing - This is scourge of afflictions during long ocean swims. Common chafing areas are the underarms, between the legs, around the neck, and around swimsuit edges and straps. Chafing is very common when you wear a wetsuit, mostly around the armpits and neck. Vaseline is the easier and best way to prevent to chafing - use plenty of it applied to all the vulnerable areas. There are a variety of alternatives to vaseline such as BodyGlide, which is less greasy and comes in a roll-on stick that makes it easy to apply. Waves and Rough Water - Open-water swims in the ocean can be very frightening in huge swells or in nasty chop whipped up by strong winds. Breaking waves offshore can sap your energy if you try to swim over them. The smartest way to avoid a breaking wave off shore and near the shore is to dive directly under it. For a breaking wave close to the shore you should try to dive to the bottom and secure yourself by grabbing the sand. Diving under waves is the best way of coping with them. The bottom line is if you are uncertain about whether you can handle the waves or rough conditions - you should withdraw. Otherwise you could lose your confidence and lose your motivation for ocean swimming. ► Pace yourself - many competitors rush out from the start, needlessly building lactate levels in their muscles. Keeping an even pace is better than a sprint at the start. ► Grow your nails - This may help you stop being swum-over by aggressive male swimmers. You need to let them know that you will protect your territory . Preserve the space around. ► Avoid the curse of chafing - Use Vaseline or other lubricants around areas prone to chafing areas. ► Relax your stroke - Don't fight the ocean and the waves and chop. Try to develop an easy rhythm that matches the current conditions. Don't worry about your pool technique. Learn to relax and go with the flow. ► Wear your goggles under your cap - The start of an open water race is often very crowded and hectic. It is likely someone could knock off your goggles if the strap is not secured under your cap. ► Don't shave right before the race - Salt water will make razor bum worse. ► Continuously Swim for the Race Time in the Ocean if you Can - Do your swimming training at an easy, steady and relaxed pace for the allotted time. Try to lift your head occasionally and do short surges to simulate race conditions. When your time is completed, swim back to the beach and relax. 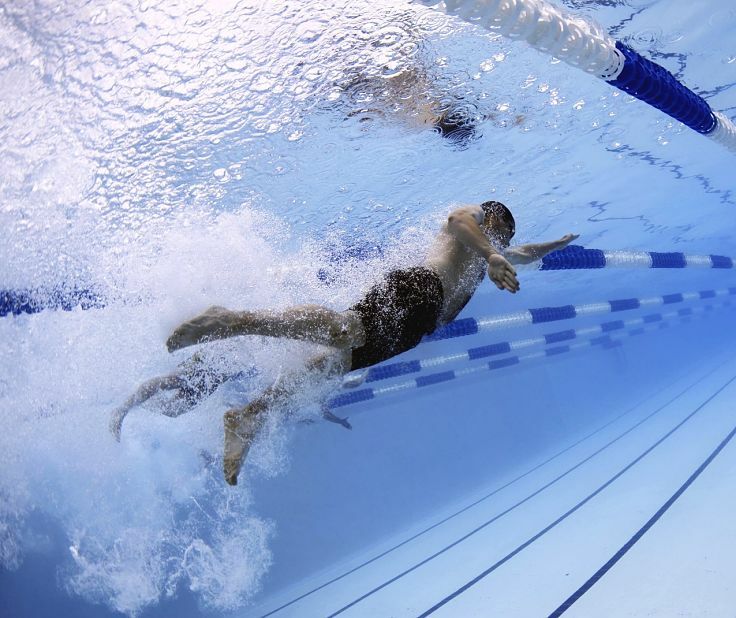 ► Energy Consumption - Swimming at a moderate pace burns about 500 calories/hour or 8 calories/minute. 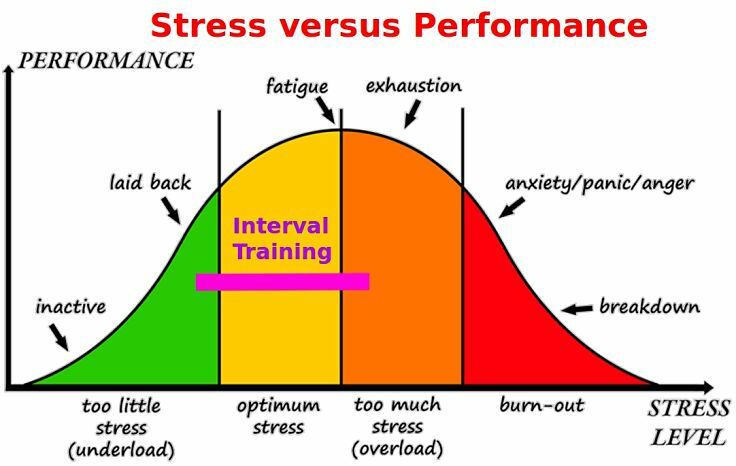 Try to train with exercises that consume energy at a similar rate. ► Short Interval Training Sets - Interval training is renowned as a way to build aerobic strategy and stamina. Swim short, but fast bursts for 2-3 minutes, returning to relaxed swimming between bursts. 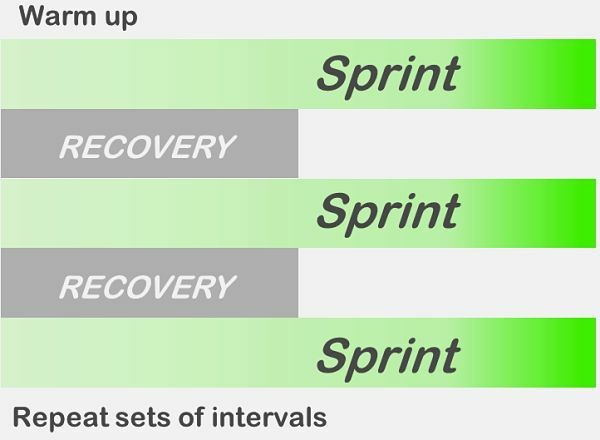 Build these intervals in your pool sessions or during ocean swims. ► Long Interval Training Sets - These sessions involve swimming at a moderate pace for about 4-6 minutes at a time with relaxed swimming in between sessions. These sessions are longer, but with lower pace than the Short Interval Training Sets. ► Mixed Interval Sessions - This is a combination of long and short interval sets, built into a long swim in the pool or ocean. ► Simulated Race Distance Trials - For confidence on the race day it is wise to swim over the same distance for several times in the pool or ocean in the weeks before the race. 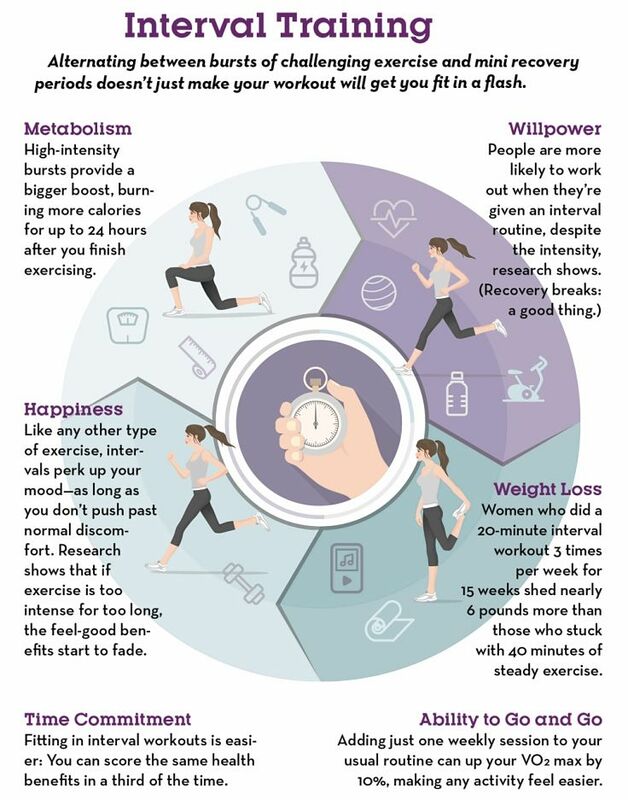 How interval training affects metabolism, attitude, motivation and willpower. Shorter periods of time are required. Ocean swimming is a joy, whether you swim regularly with friends or join in with the regular competitive events held in your area. Learn how to make the transition from pool swimming to the ocean, lake or river. Training in the pool can be boring and repetitive. Time to give open water swimming a go. Learn how to start ocean swimming here. Open water swimming requires a different stroke from pool swimming especially in winds and waves. Get the best ever tips for swimming in the ocean, lakes or rivers near you. Competitive ocean swimming events can be crowded and a crush. Learn how to cope with some great tips from experienced ocean swimmers.